A beautiful scenic view from the cliffs of the Verdon Gorge in south-eastern France. The Verdon Gorge or Grand Canyon du Verdon is located in France and is the second largest gorge in the world. The gorge runs approximately 20 kilometers in length and can reach depths of 300 metres in certain locations throughout the canyon. The magnificent cliffs, nature and amazing Verdon River that winds through the Verdon Gorge makes this one of the most spectacular canyons in Europe. At the end of the canyon the Verdon River flows into Lac de Ste Croix Lake which is one of many manufactured lakes throughout the Gorge. The walls of the cliffs are made up of limestone which are perfect for rock climbers and especially great for multi-pitch climbing. 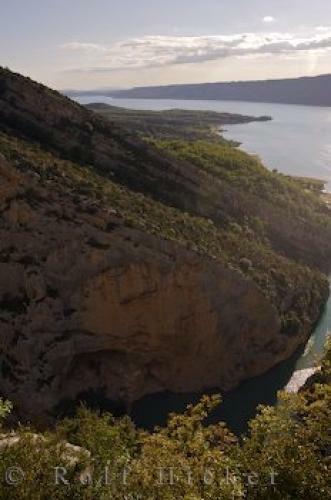 The Verdon Gorge offers over 1,500 different courses for climbing which start from approximately 20 metres to over 400 metres so there is a variety of routes for the novice or advanced climber. the Verdon River in south-eastern France. I photographed this photo with the digital SLR camera model Canon EOS-1Ds Mark II, aperture of f/8.0, exposure time of 1/125 sec. on ISO 100, as always I used a original Canon Lens, the focus lenght for this picture was 30mm.